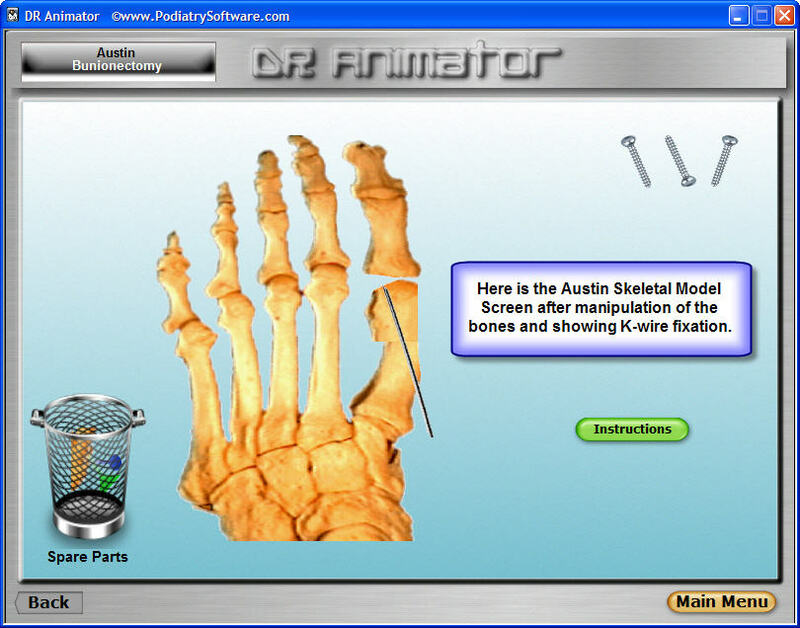 DR Animator Software combines actual photographs and x-rays with fascinating animation in order to illustrate common Podiatric surgical procedures. It is the ultimate patient education tool. Just a few minutes with DR Animator is all it takes to educate and comfort almost any patient. "If anyone wants to know how much DR Animator is worth...show them my O.R.days last week." "I believe there is no other animation product that can be as beneficial at any price." "DR Animator decreases the time it takes explaining surgery and it increases patient understanding and comfort levels." 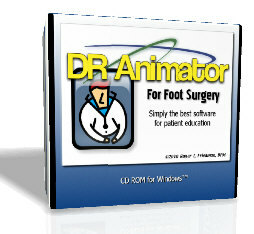 Podiatry Software and Roger L. Friedman, DPM are pleased to announce that DR Animator (previously released as Animator 2000), the premiere Podiatric computer program for patient education is shipping a new release. DR Animator contains more than 60 of the most common foot surgical procedures, easily and graphically explained in short, simple, animations. Youngswick Procedure - After continued requests, the Youngswick modification to the Austin bunionectomy has been included. 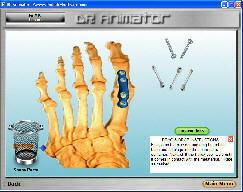 Reverse Austin for Tailor's Bunion - Animation for the treatment of Tailor's Bunion by reverse Austin osteotomy of the fifth metatarsal. Cole Midfoot Osteotomy - This animation illustrates reduction of a cavus foot deformity by midfoot wedge resection of bone. Resection of Retrocalcaneal Spur with Achilles re-attachment - Illustrates resection of retrocalcaneal spur and re-attachment of the achilles tendon. Includes the remarkable Skeletal Models Add-on!